Phone today on 02380 080681. Lines are open 24 hours a day, 7 days a week. Free telephone consultation about gym injury and accident compensation in Southampton. If you have been involved in an accident in a gym in Southampton or Hampshire and would like to discuss whether or not it’s possible to claim for compensation, then please call us now. We offer a free telephone consultation and can tell you quickly whether or not you could make a personal injury claim. Our personal injury lawyers and solicitors all work on a no win no fee* agreement and have many years of experience in helping people to gain access to the justice system to claim the compensation that they deserve. In today’s society more and more people are going to local gyms in order to lose weight or to get into shape. In fact, recent statistics state that nearly five million people in the UK have a gym membership. Given those large numbers, it comes as no surprise that from time to time accidents and injuries can occur. In cases such as this it’s only right that the victim is able to make a gym injury claim. Hampshire and Southampton gyms are in the main very well maintained. 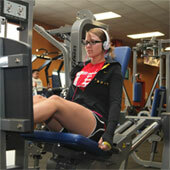 However, with heavy equipment and many moving parts, gym equipment can present a hazard. In addition to that, all staff must be properly trained and know the latest health and safety standards. Despite this it’s still a high risk environment and injury to members can occur. So if you have been injured in a gym, leisure centre, hotel, or other place where sporting activity has taken place and believe someone else or a company was at fault, then please call us now. Our personal injury solicitors have many years of experience in winning compensation awards for our clients and are very friendly and approachable. When you call us you will first talk to an accident claims advisor. They will ask you a few simple questions about the circumstances of the accident or injury and then tell you if there’s a compensation claim to be made. If there is you will be referred to one of our partner personal injury solicitors who will be able to proceed with your Southampton gym injury claim.